Posted in Lama Zopa Rinpoche News, Life on the Road with Lama Zopa Rinpoche. Lama Zopa Rinpoche (third from right), blesses the rescued goat. Photo courtesy of Ven. Holly Ansett. It was dark, maybe 9 p.m., and there was something wriggling on the path going around Bouddha Stupa. It was a baby jet black snake! We got it onto an open piece of cardboard with a little difficulty. Rinpoche wanted it to come with us around the stupa. Rinpoche gave it the name, “Thubten Tharpkye.” For the next 10 circumambulations of the stupa (he /she) got some really good karma. At the end, after dedications (ending around midnight — almost no one is around at that time), we had to say good bye to Thubten Tharpkye. We placed him safely in the drainage system from where he must have come and will spend the rest of his life. A few days later we were circumambulating Swayambhu Stupa around the base where there are so many stupas, some are very large. It is quite amazing. We usually go after dark when it is quieter and people have finished doing kora. But we walk on the road and so you have to be really careful of the Nepali cars and trucks racing along with horns blaring. Rinpoche walks slow and you have to take care to balance him as the road has holes and cars and trucks try to pass as close as they can to you. Sometimes you have to move quickly out of their way! We do one circumambulation (3 km). The last time this took nearly four hours with the stops to make offerings and prayers. We always stop at the large (about 20 ft high), very beautiful Guru Rinpoche statue and Rinpoche chants prayers. One night Rinpoche was just finishing prayers to Guru Rinpoche when there were sounds from the dark behind us. They say there are a lot thieves and drunks around after it gets dark. I looked around and could see someone lying on the ground in the dark and moving. It sounded like a woman but the noise coming from her was strange and not words that could be understood. Then to her left was a man in rags looking in really bad shape, really out of it. The old woman started to come towards us wailing strangely, the man was keeping his distance. Rinpoche asked me to offer them 100 rupees each. I only had 50 rupees (in change) for each and gave that. Then Rinpoche, in a very gentle ceremonious way, offered to each of them long beautiful khatas. To the man he offered a long blue khata and to the woman he offered a long green one. Then Rinpoche offered a long red one to the Guru Rinpoche statue. We then moved on slowly to complete the kora. Vous pouvez lire ce blog en français, traduit par le Bureau de la traduction de la FPMT – France. Osel arrived at Kopan on Monday morning to see Lama Lhundrup and stayed one week. It had been 12 years since Osel was last at Kopan. Osel recognized a lot of the older monks immediately and there was a really good connection. It didn’t seem to matter in the least that he was now a lay person and dressed cool! Osel is on the floor, flat on his back beside my desk, thinking about Rinpoche’s request to give a talk to all the Kopan monks and wearing a chuba (Rinpoche had one made for him). 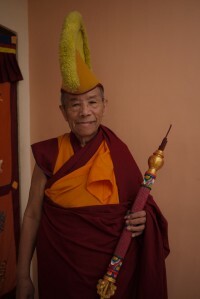 He says he doesn’t like to be pushed or pressured into doing things but it seems he is in the process of coming to terms with Rinpoche’s request although it appears hard. In the end he does give the talk. All the monks are present as well as Lama Lhundrup (a huge effort to come to this, his cancer is quite advanced) and Rinpoche. Rinpoche gave a short talk first, and then asked Osel to speak. Osel gave the talk in Tibetan (very good Tibetan). He gave “modern” advice and the monks gave a very warm response. They seem to want more! Osel said he was more than happy with his visit to Kopan. It was, “More than perfect,” he said! Osel had discussions with Rinpoche about Essential Education (formerly Universal Education). He is quite involved, very interested and will be making a video of the upcoming Essential Education event in France. Rinpoche wanted the name changed to Essential Wisdom, Osel wanted “education” in the name. Lots of discussion. The next day Osel said, “How about Universal Wisdom Education and we can call it, ‘U WE.’ ‘U’ and ‘WE,’ get it! ?” Alison Murdoch, director of Essential Education, was very happy with the news. It was an inspiring visit and made a lot of people happy. 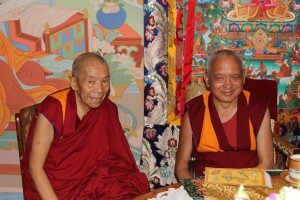 Tenzin Phuntsok Rinpoche with Lama Zopa Rinpoche, Kopan Monastery, Nepal, July 2011. Photo by Ven. Roger Kunsang. A few days later Phuntsok Rinpoche came to see Lama Zopa Rinpoche again. He replied this time, “No reason, just want to see.” He just wanted to say hello and make an offering. Lama Zopa Rinpoche gave the khata back with one hand carefully over the head of the smiling little rinpoche and then asked me to double the money in the offering envelope and give it back to Phuntsok Rinpoche. The little rinpoche, smiling, asked if his friend can come in and make an offering. Rinpoche said OK. Then, this little monk – even smaller and so close to the ground! – came in and offered a khata and offering to big rinpoche. Rinpoche asked me to double the offering and he gave it back to the very small monk. The two children both smiled and left after a little conversation. Lama Lhundrup with Lama Zopa Rinpoche, Kopan Monastery, Nepal, July 2011. Photo by Ven. Roger Kunsang. Last night Rinpoche was doing a lot of prayers, slowly as his mouth has difficulty pronouncing the words. Rinpoche wanted to go down to spend some time with Lama Lhundrup to do prayers together and give a lung. Lama Lhundrup does not move much these days and is very quiet. I asked Kunkyen if Lama Lhundrup was OK as Rinpoche wanted to come down. Then proceeded a beautiful dance – the movement between two gracious lamas: one having advanced cancer, the other having had a stroke not long ago, the right side still not working. They both acted humbly, graciously and quietly; the feeling was very calm and peaceful. Awkwardly, Rinpoche tried moving his text and with slurred speech gave the lung with Lama Lhundrup sitting opposite slightly bent over, very still and quiet. It didn’t take long. And then they both parted. “I can’t move,” says Rinpoche. “Why?” asks the physiotherapist. “Ants! I will tread on the ants.” So starts the debate between Rinpoche and Rinpoche’s Nepalese physiotherapist, Rajesh: Rajesh doesn’t understand why Rinpoche is so concerned about the ants and treading on one or two of them while he is doing his exercises. Rinpoche gives a brief explanation on compassion. Rajesh accepts. We gently remove the ants and Rinpoche continues to do his exercises. Rajesh has been working with Rinpoche for about 10 days now and they are developing a good relationship. Rajesh is very good at what he does and has helped a number of Westerners here in Nepal. This morning (Rajesh comes every morning at 7:45 a.m. for one hour) after the physiotherapy session finished, Rinpoche answered Rajesh’s question about the main difference between Buddhism and Christianity. Rinpoche answered in 10 minutes. And then Rajesh had to go to his next client. There is a lot of laughter during the session (Rajesh tells the jokes and Rinpoche keeps laughing) but at the same time Rajesh definitely keeps control of the session. It works very well. Rinpoche is also spending time checking and seeing what can be done for Khenrinpoche Lama Lhundrup. Lama Lhundrup has good care here at the monastery with his attendants and Jo, a nurse and palliative care specialist who is a student of Lama Lhundrup from New Zealand. The Tibetan doctor visits him regularly and Rinpoche is attending to the spiritual aspects of the healing: blessing water, prayer sessions with the monks, pujas, etc. Last night Rinpoche circumambulated Bouddha Stupa three times by himself and then about 10 times in the wheelchair. Rinpoche always stops at the two bigger prayer wheels and turns these with effort and difficulty with his right hand – it’s good exercise! Rinpoche said circumambulating Bouddha and Swayambhunath Stupas is very helpful for the mind. Rinpoche is really keen on circumambulating: the first night it was raining, so we did so in the rain. Most of the time we circumambulate late at night as it is quiet then. Friday June 3, Bendigo, Australia: After discussion between Rinpoche, Khadro-la and myself, we decided that Khadro-la will leave tomorrow for Nepal. 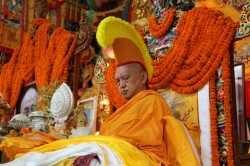 Lama Zopa Rinpoche presiding over long-life puja, Kopan Monastery, June 2011. Photo by Ven. Roger Kunsang. At the airport we ran into trouble at the check-in, which is not unusual, except the additional issue that they wanted to weigh our hand luggage with a restriction of 7 kg (15 lb)! Our carry-ons are usually at least 20 kg (44 lb) each with texts, prayer wheels, etc., so that was very hard. Then we had too many bags and it was going to cost a fortune. Then they asked us for a letter from the doctor saying Rinpoche was OK to fly, which we didn’t have! We had letters for the needles, insulin, arrangements for wheelchair service, etc., but no letter to say Rinpoche was OK to fly. And the airline said we couldn’t fly without it! So there was a lot of last minute re-shuffling and re-organizing of luggage and calls to the doctor for a letter to be faxed through to the airline. It all was eventually worked out except that some luggage got left behind. Lama Lhundrup, June 2011. Photo by Ven. Roger Kunsang. So here we are now in Nepal. Yesterday, Rinpoche was offered a special two-day long life puja at Kopan, organized by Khadro-la and Pari (Dagri) Rinpoche. Serkong Dorje Chang also attended, spontaneously appearing that morning. Lama Lhundrup attended even though he’s not well. Lama Zopa Rinpoche managed to walk down the steps (and there are a lot of steps!) Rinpoche is very determined to walk unaided and he does it fearlessly. If someone is not with him, he can easily stumble as the right leg isn’t stable yet. Rinpoche just heads off whether I am around or not! The long life puja went very well, Rinpoche was very happy. Today, Dakpa Rinpoche (ex-Abbot of Sera Mey Monastery) will begin the pujas for Rinpoche; these will go on for several days. Another important reason Rinpoche said for being in Nepal was that he could circumambulate the Swayambhunath Stupa which kept coming out very good in his mo. We did that yesterday, circumambulating part of the time in a wheelchair and part of the time walking with help. The big korwa at the base where there many stupas must be a few kilometers. We’ll also circumambulate Bouddha Stupa … it’s physiotherapy with holy objects!